Home » Blog » Can High Winds Damage my Roof? Strong winds can knock down tree branches, batter your car on the highway, and send your trash cans flying down the street. With all the chaos and damage that high winds can cause, you may begin to wonder how else they can affect you. Can strong winds actually damage a roof? The simple answer is yes, they can. You may think that you don’t have to worry as long as you don’t live in a hurricane-prone area, but that isn’t true; wind speeds of only 50 mph can damage a roof. So how do you know if your roof has sustained damage from strong winds? Below are the most common signs. This is one of the more common signs that you have a wind-damaged roof. This problem is more likely to happen over time than as a result of a single large storm. Creasing occurs when the nail does its job of keeping the shingle in place, but winds keep getting under the bottom part of the shingle, flipping it upwards. This forms a crease which looks kind of like what happens when you fold a piece of cardboard. Another common result of strong winds is flipped shingles. This occurs when the winds are strong enough to flip up a section of your roof’s underlayment. As the underlayment flips up, it takes all the shingles above it with it, leaving your roof protected by nothing but the ice and water barrier (which is not meant to protect your roof from leaks on its own). Shingles can also get pulled partially or completely off the nail due to high winds. You may notice tearing around the nail when this happens. This problem is a lot more likely to happen when you don’t get your roof installed by a good roofing company. 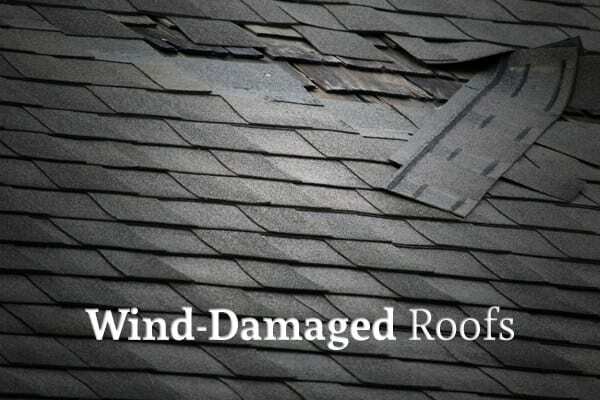 The most obvious sign of a wind-damaged roof is broken or missing shingles. Even from the ground level, it’s often easy to spot gaps in your shingles. Of course, there are other things – such as hail, heavy snow, or age – which may cause your shingles to break off, but broken shingles are a good thing to look for after you’ve experienced strong winds at your home. Gutters are an important part of your roof system, and they’re often the most susceptible to damage. Obviously, if your gutters get damaged, you’ll have to get them replaced or repaired. Damaged gutters are also a sign that there’s likely damage to your shingles and other roof parts as well. Your chimney can also get damaged by strong winds. The most common damage caused by strong winds is damaged flashing. Chimney flashing is the strip of metal that surrounds the bottom part of your chimney. It’s meant to help ensure that water can’t leak into your home. Strong winds may damage this flashing; it’s important to get this damage fixed promptly. Roof leaks are the most obvious sign that you have a wind-damaged roof. Whenever your roof leaks, you should get your roof inspected as soon as possible to determine where it needs to be repaired; otherwise, your home could end up sustaining thousands of dollars worth of damage. If your roof has sustained damage due to high winds, contact Acme Roof Systems, Inc. They will determine the extent of the damage and get to work repairing it. If you aren’t sure whether your roof’s been damaged or not, they can also perform roof inspections. Call them today to learn more about their roofing services.